The trailers to this movie looked like this was going to be a movie you pick up in the dollar bin at a Walmart on a Tuesday afternoon because you hate your life while also getting a whole frozen pizza and a pint of ice cream to drown your sorrows while it plays in the background. Well…I am eighty percent correct but there is also something in its favor. Let’s get reel and break this down. The actual mythology of the story is fascinating and could have developed into rich storytelling and have an epic scope. 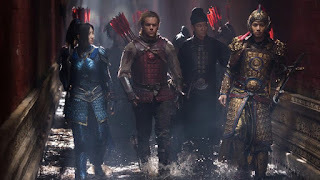 The visual style from the director is wonderful and blends green screen, CGI, and practical effects into a colorful wonder that works in the 3D format and provides depth and excitement in the battle scenes. The story is jumbled, rushed, and has no emotional weight to anything happening with the plot or characters. I am not looking for an Oscar winning story but I at least want to care about the characters when the stakes are raised and the danger is apparent. The dialogue is awful and caters to awkward humor that the writer thought was funny but…it’s just not. The characters themselves are lifeless, underdeveloped, and some of them are pointless and have no effect on the story. Some stuff doesn’t make sense and happen for the sake of the “plot”. The director also manages to screw up the three battles. When in a war or action film there are always three action set pieces building off one another and leading up to the climax battle where everything is on the line. This film has a strong first battle, a short pointless second battle, and a hurried and confusing third battle. I rarely say this, but after agreeing with my friend at the screening, I think this story would have benefited with a longer runtime. It would have had the care, weight, and ambitious feel to it and actually been a watchable, fun monster movie. Matt Damon is atrocious. His accent is all over the place and towards the end he gave up and the accent was non-existent. It was a weird mix of Boston, Irish, and cockney accent and the dialogue accompanying him doesn’t help this either. The main Chinese actress who plays the badass of the movie was great in her stunts but her English accent needed a bit of work. I couldn’t take her seriously in any dramatic situation. Everyone else was…well…let’s just say you aren’t going to praising them after you see it. Regardless of the sh*t storm I was spewed above, it’s visually stunning. The colors mixed in so well with the environments and some the shot compositions can be framed as a painting. I guess it’s over quick? The special effects of the creatures were actually better than I thought considering I thought they looked cheap in the trailers. It is very possible that the 3D helped the look of the creatures and brought them out from the green screen and in the forefront to admire the detail. While the action and battle sequences were fun and exciting, everything in between was dull and halted the movie to a snail’s pace. This is going to be weird but try and follow me here: I don’t recommend this at all but if you are curious I would recommend seeing it in theaters because of the visual spectacle instead of streaming or rental. That’s all I got.